It’s that time of the year when you can officially wear boots of any length. From ankle boots to knee-length boots, the choice is aplenty. There are boots of numerous designs. From leather boots to suede boots, from plain boots to embroidered boots, you can wear different styles. however, if you love to stay on trend, you should be aware of what’s in demand right now. This cold weather season, snakeskin boots have become the rage. You can see fashion girls wearing snakeskin boots like never before. From high heels to block heels, the styles are varied. Check out some of the ways in which you can wear your snakeskin boots with different outfits. A fur coat is enough to make a style statement. When you add calf-length snakeskin boots to the mix, you make it even more stylish. Pair up with skinny jeans and you don’t have to worry about losing points on the fashion meter. As winter approaches and everything turns white with snow, you can match your outfit with the surrounding. Go for an all-white outfit combo with white women’s stylish sweater paired with white pants or jeans. If it gets colder, layer up with a white long coat. Coordinate your outfit with your snakeskin boots in a similar shade. Ankle-length boots will look best. If you prefer to go all black instead of white this winter, your snakeskin boots can add a contrasting touch to your look. A black jeans, black leather jacket or a quilted jacket, you can choose any combination. Boost up your style statement with ankle length boots in contrasting color. For days when the weather is less chilly, you can pick up a top in a vibrant color and pair it up with your favorite jeans. Let your shoes do the rest. 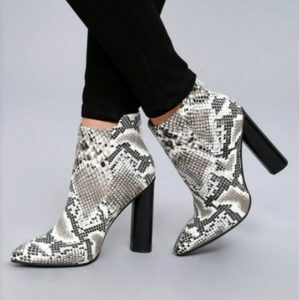 Pick up a calf-length pair of snakeskin boots and see heads turn your way! Next Love Dresses? Wear These Long-Sleeve Dresses Even In Fall!